It was all about spelling foodstuffs for the winners of both the Maricopa Unified School District and the Legacy Traditional School spelling bees. Both competitions were held on Jan. 21 to determine the winners and runners-up who will advance to the 47th Annual Pinal County Spelling Bee tomorrow, Feb. 19, at 9:30 a.m. in the Vista Grande High School auditorium in Casa Grande. All school districts in Pinal County and several charter schools will be represented at the event. Each student will be given one word per round. He or she can ask for a definition, to have the word used in a sentence, the word’s language of origin and for any alternate pronunciations. Tyler Curtis, a fifth grader from Maricopa Elementary School, won her district’s contest by spelling ‘tamale’ correctly in round three. The runner-up was fifth grader Kelleigh Hogan from Saddleback Elementary School. Curtis and Hogan, as well as alternates Janaa Manning from Santa Cruz Elementary and Delano Jackson from Desert Wind Middle School, will be at the county competition. ‘Parmesan’ was the winning word for Anab Abdulle, a sixth grader at Legacy Traditional. 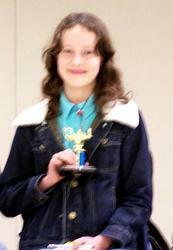 Runner-up was sixth grader Lane Johnson, and fourth grader Fabiana Petroza placed third. All three will be in Casa Grande for the county spelling bee.